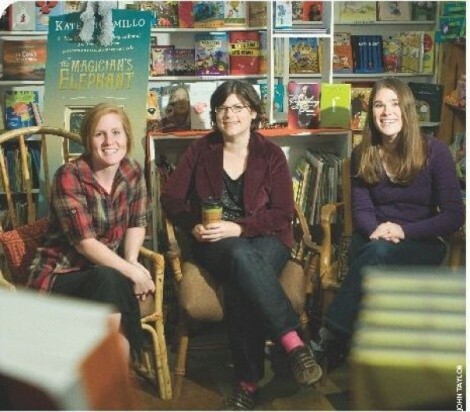 Young at Heart: Utah young-adult authors discuss the genre--and mutual respect--that unites them. Over the past few years, Utah has seen the emergence of several talented voices in young-adult fiction—books targeted at “tween” and teen readers. City Weekly gathered three of these authors— Sara Zarr (Once Was Lost), Emily Wing Smith (The Way He Lived) and Ann Dee Ellis (Everything Is Fine)—to discuss their work and their collegial interactions. The following is a selected transcript of an hour-long conversation. City Weekly: Did you know one another before you published? Sara Zarr: I met Emily in March ’08 at the Utah Valley University Forum on Children’s Literature. She came up and introduced herself and said she had a book coming out that fall, and she came to my talk. … Basically she stalked me. Emily Wing Smith: Oh yeah, that whole day. SZ: Then, did I give you my e-mail? SZ: So Emily came, and then [local author] James Dashner, and we had good chemistry. CW: What do you think that group has done for each of you? SZ: Writing is otherwise so isolated, just seeing people once a week, knowing I have to put on clothes. EWS: Sometimes, my husband will come home from work … and he’ll be like, “Have you left the house today?” “Why?” “Well, your hair’s a little matted; have you brushed it?” … So it’s nice to have someone else to be writing with. People ask, “Does that mean you critique each other’s work?” Until I read Sara’s book recently, I had no idea what it was about. We don’t share that, but to be able to have someone to bounce ideas off of, or ask questions about the business. SZ: Same thing with [Emily’s book]. I had already been hanging out with her, and it was like, “Crap, what if I hate it?” … And I loved it. Same as with Ann Dee’s book. Both of them—I’m jealous of their writing, that really unique voice they both have. ADE: We’re all jealous, that’s what really brings us together. EWS: It’s the jealousy that makes us work harder. CW: Why write in this genre? ADE: I think my [writing] voice is about a 13-year-old voice, and I like to read about 13-year-olds, and in my personal essays, I sound 13. So it just made sense for me to write young-adult fiction. SZ: I don’t think it’s one of those things you choose. It’s just that whenever I thought of stories, they were always about 14- or 15or 16-year-olds. And I also always liked reading young-adult fiction. I was in high school in the ’80s, and the ’80s was a good time for young-adult fiction. EWS: Even from when I was really young, I would always want to write the category of books that I was reading. … If I was reading Baby-sitters Club, I wanted to write the next Baby-sitters Club. And when I read young-adult fiction, that’s what I wanted to write. And then I just kind of stopped there. … So yeah, if Ann Dee is 13, I guess I’m probably about 17. CW: How do you maintain a connection to your inner 13-year-old or 17-year-old, so that your characters feel genuine to you? SZ: I think when writers [in this genre] are first beginning, they worry a lot about that: “Maybe kids today are different.” So they try to hang out in online teen chat rooms or … eavesdrop at coffee shops. But that kind of “research” is exactly the kind of thing that will make it feel contrived. ADE: The things that I was experiencing in high school, I’m still experiencing now. The insecurities I was feeling then, I’m feeling here, right now, in this interview. … I think maybe it’s just more intense in junior high or high school, but they’re things you go through over and over. EWS: I took a long-term [high school] substitute-teaching job, and people were like, “Oh, I bet that gives you great fodder for story ideas.” And I’m like, “Well, no,” … It’s not like, “I can write a book about what kids are talking about these days.” That would be weird, and probably wouldn’t work for anyone. CW: Writing about issues that teens face, have you ever gotten any kind of, “Thank you for saying this” feedback? ADE: I think that was why it was so exciting to have an editor say, “I want this book.” It was like, “You get it?” And then a reader says that, and it’s like connecting the dots. We all are dealing with the same things, and if you write something honestly, people are going to feel it. I think that’s the beauty of writing from your heart. SZ: That is awesome, what you just said. That’s going to be the best part of the whole interview. EWS: That has to be the pull quote.